Ghana Needs Dual Carriageway Roads.. It saddens my heart to see innocent souls perish in horrific road accidents in what will best be described as mass failure on the part of current and previous governments. I believe the only way to solve the horrific accidents on our roads is for government to consider constructing dual carriageways or single lane roads . 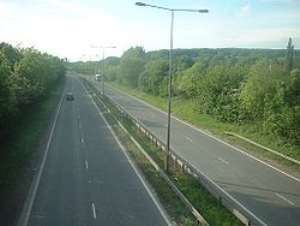 A dual carriageway is a class of road where vehicles travel in opposite directions and normally separated by a central reservation where street lights are normally mounted. Roads with two or more carriageways which are designed to higher standards with controlled access are generally classed as motorways. A road without a central reservation is a single carriageway regardless of the number of lanes. It is an established fact that, dual carriageways have improved road traffic safety in developed countries over single carriageways and typically have higher speed limits as a result. Some of our roads are too narrow which in effect should accommodate vehicles heading toward one direction but what do we see on our roads? single lane roads marked with funny colours to deceive the ordinary Ghanaian and later call it a first class road. How absurd ?. I travelled to Koforidua over the weekend and that was my first time going to the Kof City, I used the Accra-Aburi stretch and I must confess, I regretted ever using that stretch.. the road is very narrow and curvy which obstruct smooth driving and makes driving very difficult and in extreme cases, one might loose control of the steer which might result in the unfortunate happening . Our Politicians sit on round tables with their pot bellies as big as wincrafts and drink their heads off. They then come up with bloated budgets to contrust "world class" roads but ends up contrusting death traps. They board expensive flights to their constituencies for fear of being killed by their own death traps and in rare cases uses their high fuel consuming vehicles (4x4's) to these places, all at the expense of the poor tax payer. It is about time to tell these "politrickcians" and all other stakeholders in the transportation industry that , every single soul matters . I will end by craving the indulgence of my very friends most especially the youth of our dear nation not to justify mediocrity when government officials gives them peanuts to exaggerate and paint pictures of projects that never existed in order to keep them in power. Angoo of Africa, responding to a higher calling.. This author has authored 1 publications on Modern Ghana.